As I’ve stated previously here, if you’re looking to find a Christian band who pushes the boundaries, who writes more than the cliché, and who plays with passion, look no further than River & Robots. I began emailing with Jonathan Ogden, the lead singer and main songwriter for R&R, a few months ago. After all, their website states, “If you’re interested in booking us, or just want to say hello, send us an email at riversandrobots@gmail.com and we’ll get back to you!” After a few notes back and forth, Jonathan agreed to an interview all the way from Manchester, England. Never give me permission to talk to you. I’ll take advantage of it. KJ: How did you get your start in music? R&R: We have each grown up in church and been involved in our local church worship teams from an early age. I learnt piano and guitar when I was in high school, and started playing at church then, and then got into leading worship in my late teens. I think it’s a similar story for each of us! KJ: How did you all end up playing together as a group? R&R: I work for a Christian organisation called The Message Trust who do lots of evangelism here in Manchester by sending teams like bands, theatre companies and dance groups into schools and prisons and putting on gigs, so it’s a great place to meet other creative Christians in Manchester. Me and David [Hales - guitar, ukulele, vocals] both work in the creative team at The Message doing design and video work, so we met that way, Nathan [Stirling - bass, guitar, percussion, vocals] went to David’s church and was also working for another charity in the same building, and then I was also part of an associated ministry called Prayer Storm that ran meetings with intercession and worship every month, so I met Kelani [Koyejo - drums, vocals] through playing in the band at the Prayer Storm night. Something just clicked with these guys and I wasn’t even considering doing a band, but I made such great friends with them so quickly, that it just felt right, and I asked them to come and help me do this Rivers & Robots thing in late 2012. KJ: Explain your band name. R&R: The name is purely a musical thing really. The first album was this mixture of folky, melodic sounding stuff, combined with electronic production and a lot of synths. So the ‘Rivers’ is the more acoustic side of things, and 'Robots’ is the electronic, and the combination of the two is the kind of sound we have. It’s changed a bit since then, but we still have it. I think songs like 'White As Snow’ are very much in the Rivers category, and 'Fall Down’ in the Robots category, and others like 'We Have Overcome’ fall somewhere in the middle. KJ: What is your songwriting process? R&R: With the first 2 albums Rivers & Robots was a solo project, so I wrote everything. I tend to still do most of the writing, but a couple I’ve co-written with the guys. I wrote 'White As Snow’ with David, and 'Light Will Dawn’ with Nathan. And we come up with the musical side of things as a band now. Some songs like 'Shepherd Of My Soul’ I just brought as stripped-down acoustic songs and then we worked on the arrangement together in a practise. KJ: Individually and as a group, who are some of your biggest musical influences? R&R: We listen to tons of music, we’re all big music geeks, so we could spend all day listing off a load of bands we like, but there aren’t any direct influences I would say. I guess a little bit of everything that we like will naturally seep into the process of writing songs, but we like to try and find our own style wherever possible. We all grew up listening to heavy rock, but we listen to all sorts now. KJ: Do you guys lead worship at a church in Manchester? Together or at different churches individually? R&R: We do all lead worship, but at different churches. We’re all part of small local churches around the area, so we all serve there, both leading and playing in the bands. KJ: What is the overall Christian culture/atmosphere like there? R&R: It’s awesome! There are so many great ministries coming out, and loads of creative stuff going on with worship and prayer, we’re blessed to be involved in a lot of different things like Prayer Storm, Manchester House of Prayer, The Message and our individual churches, so we get to work a lot with churches all around Manchester and it feels like there’s starting to be a real unity between the churches; it’s great. KJ: What is your view on contemporary Christian music as a whole? R&R: I think we’re in a really exciting time right now. We’re seeing worship springing up all over the world and in so many different styles, I think we’re moving on from there being a “christian music industry” as it were, into there being so many different styles out there and different expressions in the church. Everywhere we go there are new worship bands and teams that aren’t big names, but they’re amazing and they’re just faithfully going for it with their local community. And I believe that we’ll see more and more of this worship movement growing alongside the prayer movement all over the world until Jesus comes back! KJ: Is there anything you’d want to see change? Stay the same? KJ: From Take Everything to All Things New, what has changed in your musical style/taste/etc? R&R: The biggest difference is that All Things New is the first band album! So this is the first time I’ve recorded in a space that isn’t my bedroom, and used almost entirely real instruments, whereas Take Everything was almost entirely done on my laptop. I think it feels like a natural progression rather than a change. It’s the same sound, but it’s bigger and more real and just better. We probably stayed more towards the 'rivers’ side than the 'robots’ for this album because we wanted it to sound like how we play together live, with some of the songs literally just being drums, keys, bass and guitar with vocals, so it sounds exactly like how we play it. But I think moving on we’ll start to bring in more of the electronic stuff again, and get a little more 'robots’. KJ: Where do you see your music going as you continue to write and record? R&R: Wherever God decides to take it! We’re going to keep doing worship nights in Manchester and build up a local community of worshippers here, and continue to go wherever people invite us, and when God speaks something to us, we’ll write about it, and see what happens! KJ: What is your favorite track on ATN? Your least favorite? R&R: Honestly, my favourite song changes every week, which I really like. At the moment it’s between “You Hear Me” and “Shepherd Of My Soul”. KJ: Where did you record ATN? Same or different as past albums? KJ: What is your goal for your band? Full time touring? Church leadership? Just a hobby? R&R: We would love to go full time, but for now we’re just taking it step-by-step. We’ve already done so much more that I thought it was going to be. We prefer to just let God lead us, and thank Him for every opportunity we get, rather than planning where we want to be. But God gave us a big vision, and I’m sure this is just the start! KJ: When do you see your tour taking you to the US? Do you? R&R: We would love to come to the US, we’re just waiting for the right time and the right opportunity. There’s a few potential opportunities lined up, so we’ll see what happens! KJ: If you could sum up your goal in writing, playing, and recording music in one sentence, what would it be? R&R: The goal is to pursue the knowledge of God, to search Him out, and get revelation of who He is, to respond in worship, be it musical or otherwise, and in the process declare who He is and make Him known to the church, so we can all grow in the knowledge of God together! KJ: When you’re not playing music, how do you spend your time? R&R: We all have full time jobs at the moment, so I’m doing web and graphic design. And we’re all involved in our churches in various ways, so that keeps us busy. And with free time we’ll generally be eating, going to watch films, taking photos of cool places! KJ: Your website saying you enjoy a good cup of tea – (coming from an American coffee drinker, here) – why is tea better than coffee? R&R: Haha! It’s not really better than coffee. I just love it! You can’t beat a good cup of tea and some biscuits. 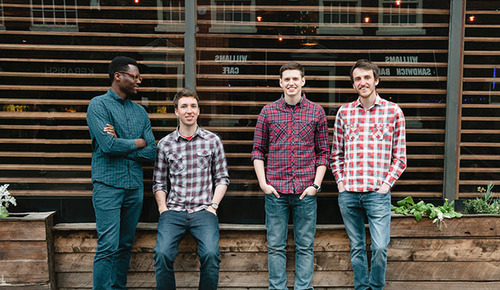 There you go – this band has a fantastic perspective on music and on faith. Check them out on Spotify, iTunes, or www.riversandrobots.com as soon as you can. And if Jonathan likes English biscuits, imagine him discovering a Chick-Fil-A biscuit on a Saturday morning before a good college football game. P.S. - British spellings and vocabulary are so much better than American English.